Designed specifically for Jet Ski assisted take offs, these boards are short and narrow with flatter tail rockers. Bottoms are usually light Vee in the nose with a concave running between the surfers feet. These boards are designed to hold their speed over long distances as well as maneuver in steep, hollow conditions. 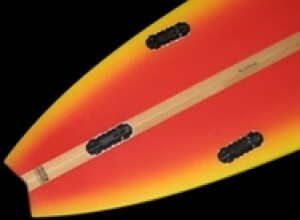 We use big heavy stringers for strength and to "weight up" the core of these boards. Then, we glass the boards up to the desired weight. This method of construction gives a nice balanced weight and a very strong, durable board. In over a decade of real deal conditions, we haven't had a single board break or fail.